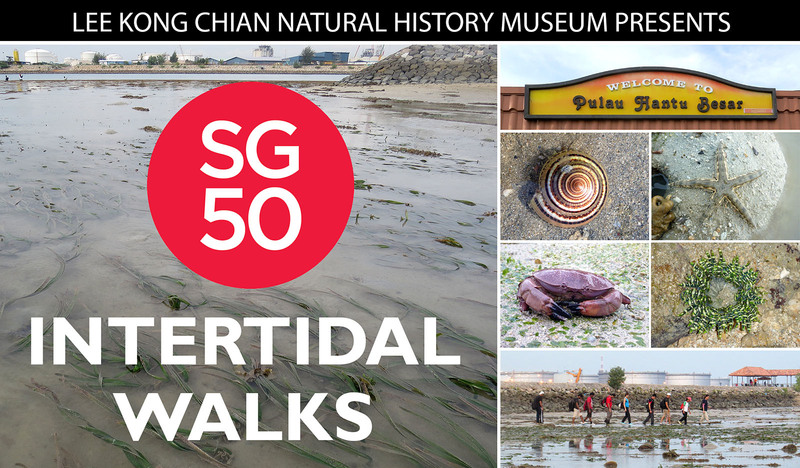 As part of the SG50 celebrations, the Lee Kong Chian Natural History Museum will organise intertidal guided walks to take students and the community out to the Southern Islands to explore a hidden slice of Singapore’s rich biodiversity. Our nature guides will show you marine habitats alive with sea stars, corals, crabs, other cool intertidal organisms, and how they live and can continue to share their homes with over 5 million people in Singapore. These walks are supported by the SG50 Celebration Fund, and cost $32.10 per pax (UP $56.70). To enquire, please email nhmlearning@nus.edu.sg. Participants must be at least 13 years of age, physically fit and able to complete a 2.5 hour slow walk. Payment must be made at least 1 week before the walk. LKCNHM is committed to organising a successful programme. However, as a minimum of 30 participants are required for each session, LKCNHM reserves the right to cancel any session in the event the minimum number of participants is not met. In such an event, participant may be offered a full refund or alternative slots. In the event of inclement weather conditions, LKCNHM reserves the right to cancel, terminate, suspend or modify the programme. ← Win a pair of tickets to the Lee Kong Chian Natural History Museum! May I know if the target group are schools, does it mean that the public cannot register for it? Dear Yang Yang, you may register your interest with nhmlearning@nus.edu.sg, but the priority will be given to schools.